Get comfy, because I have about eleventy billion photos for you! Let’s go back in time for a minute. When we moved into this house, it stank of dogs and cigarette smoke. BAAADLY. So, every surface in the house got covered in Kilz and then beige paint. 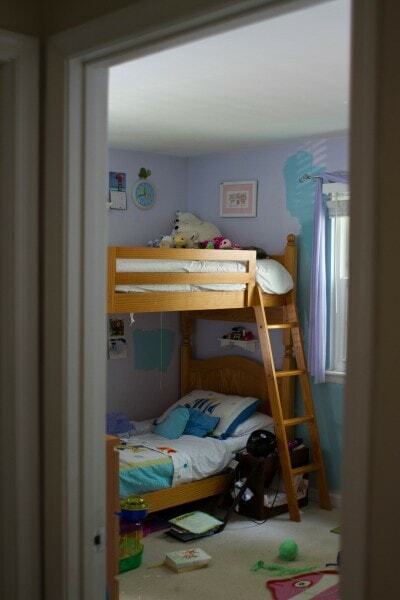 But then we started to add some color in, and at the time, Lisey and Sonia shared this room. 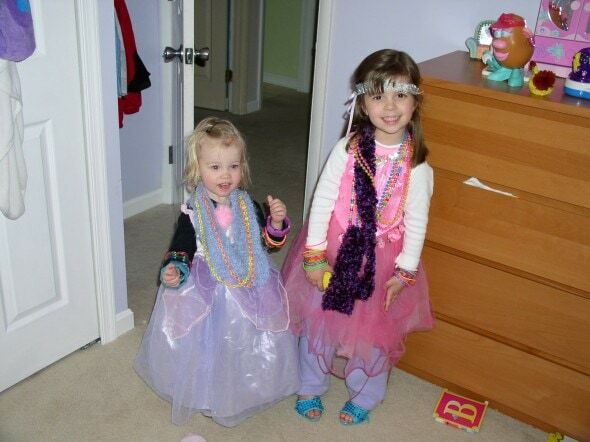 Sonia was far too small to have paint opinions, so Lisey chose purple. 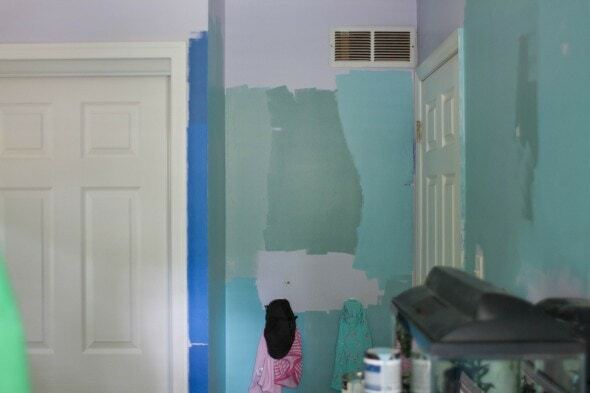 I don’t have a super good before picture of their room because I started slapping paint samples up before I remember to grab my camera. Here’s an older post with more photos, though. And the room has remained purple, even though Lisey now has her own bedroom, painted in a classy silvery blue, and Zoe has moved in with Sonia. 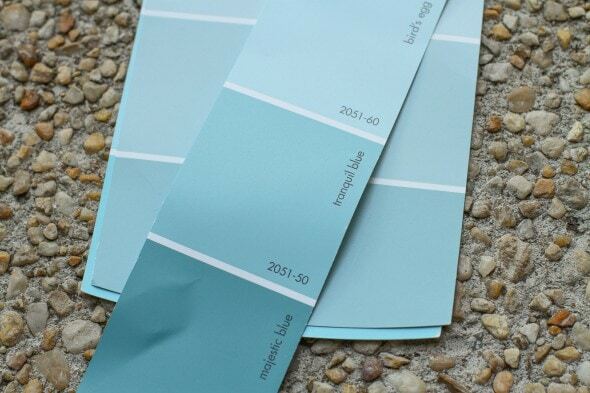 For some time now, Sonia and Zoe have felt that they’d like to pick a new color for their walls, so this summer, they chose something that was a compromise between blue and green. It’s Benjamin Moore Tranquil Blue, and mercifully, this shade brought an end to the paint-picking drama we were experiencing. As with my other room painting projects, I repainted the moldings and the ceiling without taping the edges, so the white paint overlapped onto the wall. Then I taped off the ceiling and moldings/windows before I painted the walls. This gives a nice clean, crisp edge all around. 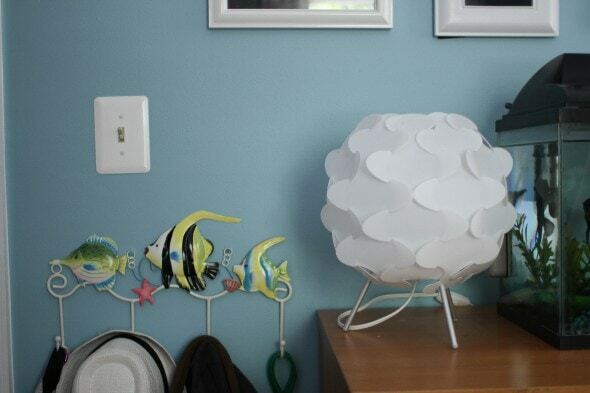 The handy thing is that this shade happens to coordinate quite nicely with all of Zoe’s preexisting fishy decor items. And we didn’t even plan that! 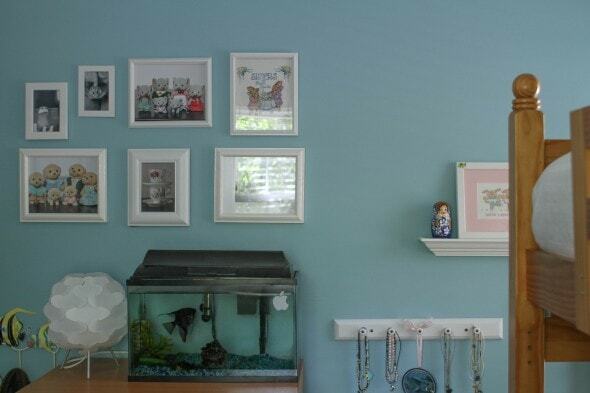 When I redid Lisey’s room, we did a little frame grouping holding some of her favorite things, and Sonia and Zoe wanted something similar. 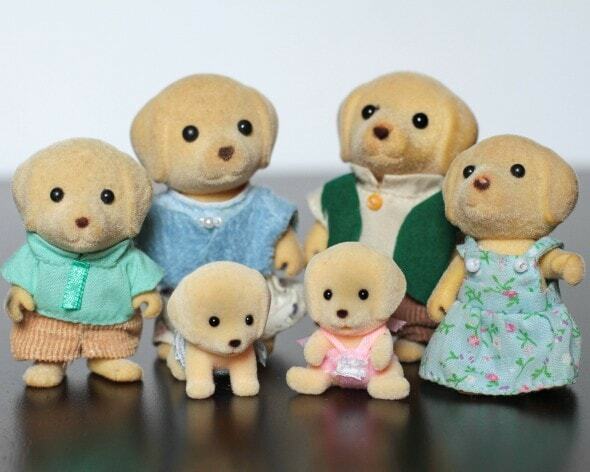 So, remember how I set their Calico Critters up for psuedo family portraits? Here they are. The elephants especially crack me up. For the arrangement, I took a bunch of mismatched frames, painted them all white, and now they all look like they go together. 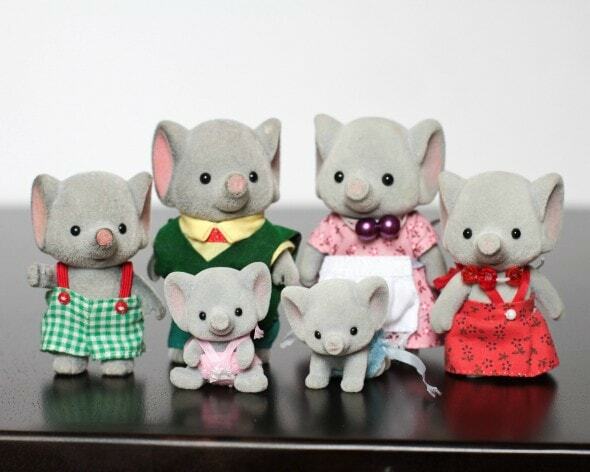 In addition to the Calico Critters, we have Wilson and Sheldon (their beloved hamsters), tea cups (because they love tea parties) and of course, Myrtle Beach. 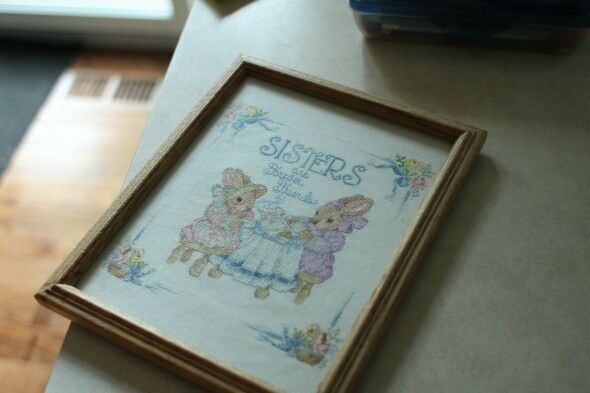 And in the top right is a cross-stitch I made for my sister when we were teenagers and she’s had it since. However, her daughter has no sisters (a bumper crop of brothers instead! ), so she gave it back to me. The oak frame was old and faded and I like it way better now that it’s spray painted. Here’s a more straight-on view, which has bad window glare, but shows you what the layout actually looks like! The girls hang their pjs behind the door, and they’d kind of outgrown the height of the old hooks, so I filled those holes and moved the hooks on up. 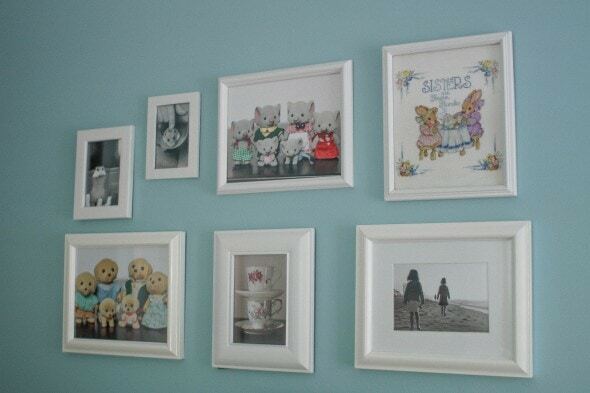 Remember my post about old frames being good for kids’ artwork? 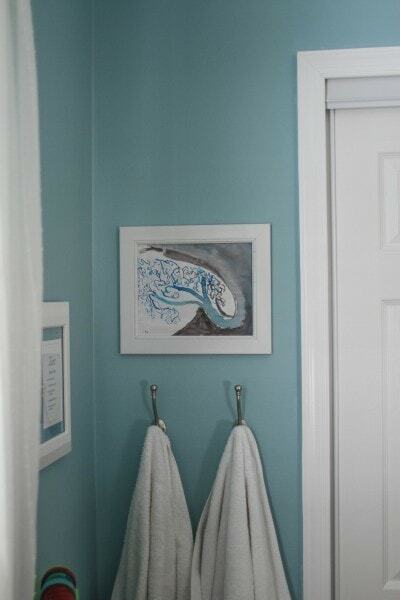 This frame, seen in that post, still has no glass, but it’s holding a watercolor Sonia made before we even picked a paint color for the walls. It matches pretty perfectly, though! Zoe’s original bulletin board (spray-painted, from Goodwill) bit the dust this summer, so I picked her up a new one from Aldi. The frame was light wood, so I taped off the middle of the board and spray-painted the frame white. 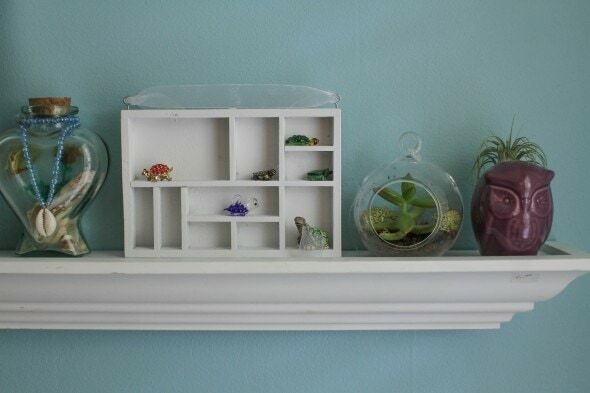 Her little white shelf is a Goodwill find from years ago. Sonia, who sleeps in the top bunk, also has a little white Goodwill shelf. I probably should spray paint her bulletin board white as well, but I just didn’t. Also. 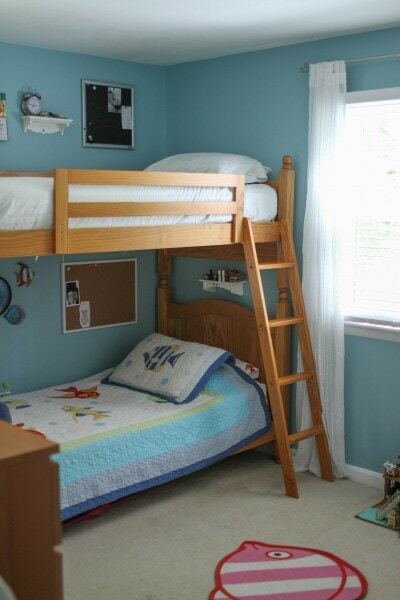 I think their room would look AWESOME if I painted their bed white. However, I’m running low on motivation and also summer appears to be ending (wah! ), so it’s just gonna have to stay stained for now. Good thing I’m not a perfectionist. To help Sonia and Zoe corral their stuffed animals, I gave them each a basket (they were empty from previous decluttering!). This shelf is from Goodwill, and the little white display thingie is from Mr. FG’s mom, who didn’t need it anymore. It needed some freshening up, so I spray painted it white. But I wish I’d just brushed the paint on because spray painting something with that many crevices is a special kind of torture. Only took 3,483,948,573,985 coats of paint. We talked about those last week. 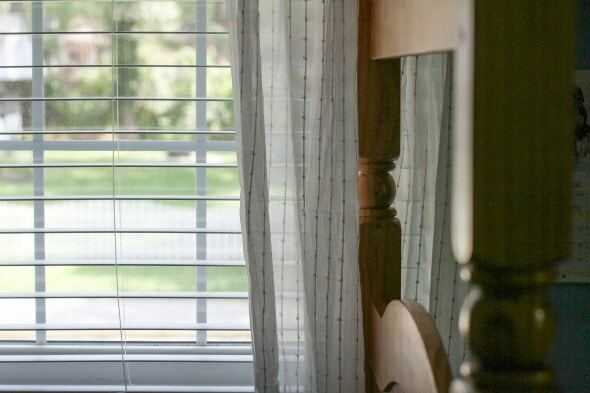 I ended up opting for the middle curtain rod height and I am just not going to think about that anymore. 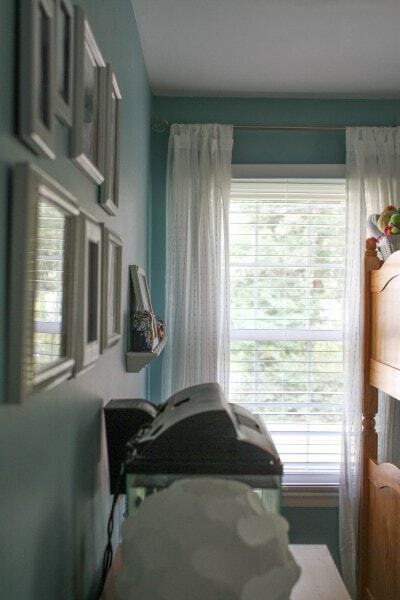 These are Matilda curtains from Ikea, and they’re $20/pair. This bookshelf in their room IS white, and it’s what makes me think the rest of the furniture would be great in white. Oh well. Oh! 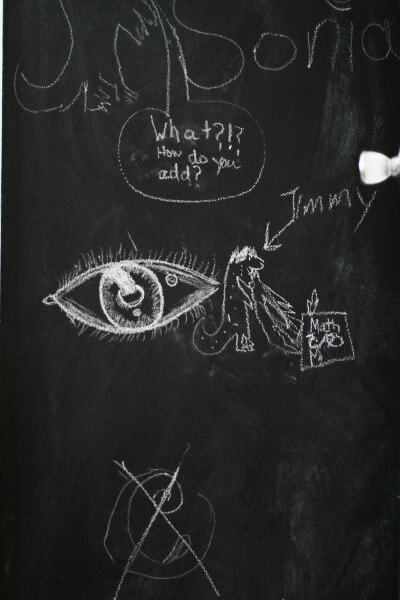 The last feature I want to show you is our chalkboard wall. Sonia and Zoe have been wanting chalkboard paint somewhere for a while, so we chose a small wall in their room for this. I had a can of roll-on/brush-on chalkboard paint in the house because when I worked with Cabot last summer, I bought spray AND roll-on chalkboard paint because I wasn’t sure which I’d need. Anyway, I taped the edges, rolled two coats of the paint on (4 hours dry time between) and then we let the paint sit for 3 days. I was a little nervous about how terribly dark that wall was at first. The contrast between it and the light walls was a little much. But, after the paint sat for 3 days, we rubbed white chalk all over the surface to condition it (this is supposed to prevent shadowing), wiped it off, and my kids started drawing. I actually like the wall WAY more now that there’s chalk dust on it. You can’t really tell in the photos, but it’s more gray and it just goes with the rest of the room better. 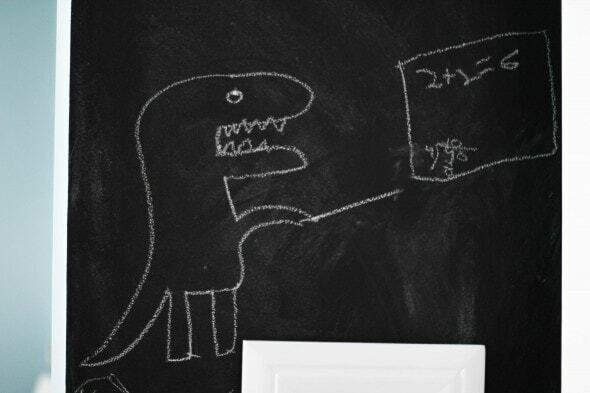 Do you remember the dinosaur Lisey drew on her math paper last year? He’s back. His math skills have gotten worse. Ohhh! And remember the ugly old Goodwill mirror that I finished with Cabot stain? The blue didn’t match the new wall color, so I spray painted that white too. And that, I think, is the end of the room tour. I’m super glad that I managed to get this project done before school starts. Yay! Sonia and Zoe are very happy with the results…colorful, but also slightly more sophisticated than before, which pleases them mightily. I didn’t keep a running tally of my expenses, but I bought 8 sample jars (! ), one gallon of Benjamin Moore paint, three cans of spray paint, a roll of painter’s tape, and a small can of ceiling paint. Plus I spent $40 on Ikea curtains and $5 on a bulletin board for Zoe. Soo, this was a pretty cheap project money-wise. Time-wise, it was a little on the expensive side. But it’s finished! So now I can breathe a sigh of relief and start the school year. P.S. All of my kids’ rooms have now been recently decorated/painted, which is making me feel quite accomplished. 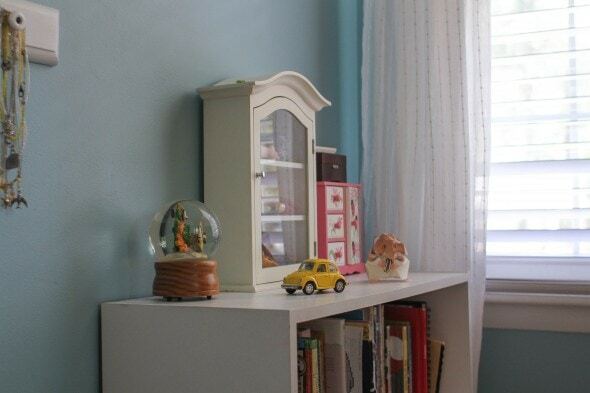 In case you weren’t around then, here’s Lisey’s silvery blue room and here’s Joshua’s gray room. Amazon links are affiliate links. I am not otherwise affiliated with any of the companies that make the supplies I use…I just use the supplies because I love ’em! I have used Dr. Bronner’s for years to shampoo. I take one of those bear containers that honey comes in and pour in about 1/8th cup and fill with distilled water. I usually have to play with the proportions for a while to get it right. Then I rinse with diluted vinegar. Once a week I use regular shampoo and conditioner. I shampoo every other day. It works for me. Do you find that you also put energy into every other room other than your own? I basically only go in my bedroom to dress and sleep, so it never occurs to me to do any decorating there! It’s probably also the most private room in the house, so it helps that few see it. Well, I’m kind of an exception to that rule. 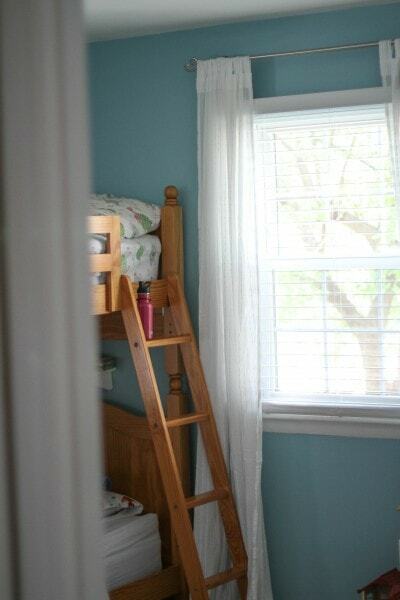 I keep my bedroom pretty clean and clutter free, and I actually painted my own room before I did any of my kids’ rooms! It’s a burgundy, which is fine, but I’m actually getting a little bit tired of it. So if I ever end up with a bunch of motivation, I might redo it. My areas of neglect are my laundry room and office! I have such a terrible time keeping those areas in good shape. I now see I put my comment under the wrong post. It should have been under the one about Dr. Bronner’s castile soap. Looks LOVELY! Yay for nice, clean, freshly done rooms. There’s nothing like that feeling. Looks great! Love the crispness of the white against the blue/green. Wanna come to my house next? I have some white furniture and now I want to paint it all white…so crisp and clean. The room looks fantastic. Job well done! You did a wonderful job! I love the color that you ended up with. 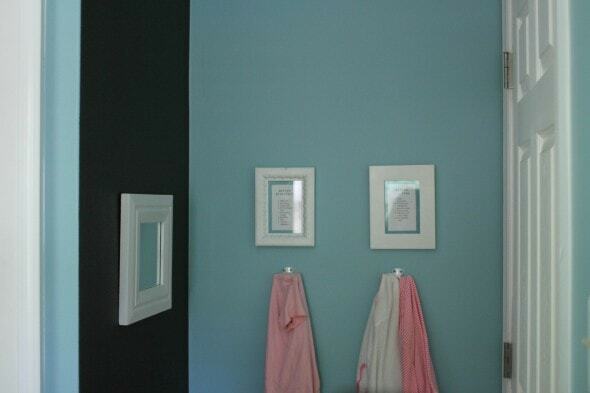 You can get chalk board paint in many colors. I used brown when I painted a door in my kitchen this summer. I think the black looks fine but I figured I would let you know in case you still feel its too dark after you have it a while. I think we’re gonna be fine now that there’s chalk dust on the wall, but good to know about the colors. I bought my paint at a craft store and they only had the one color then, but I bet a home improvement store would have more color options. Wow! Bravo! So many clever ideas. The final blue and white looks so sharp, and the chalkboard wall — genius! 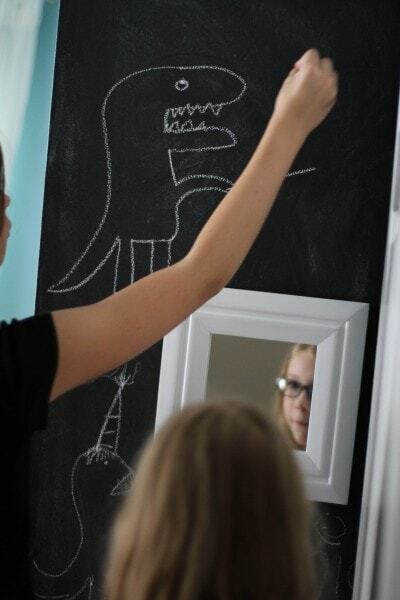 Your kids are so clever and whatis a perfect work board to just explore and doodle on. 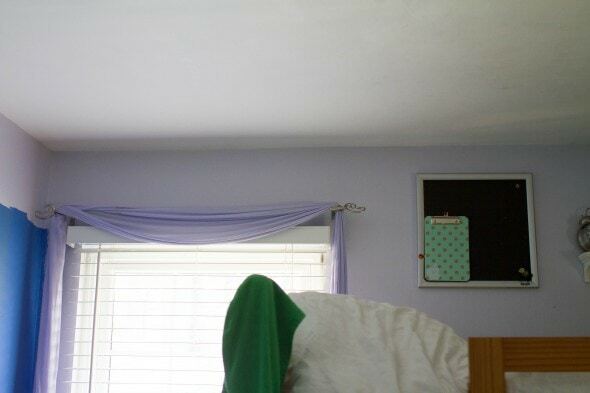 Oh, and the curtains seem perfect. I especially love how each child’s art is represented along with their favorite things — the Calico Critters and hamsters are especially adorable. 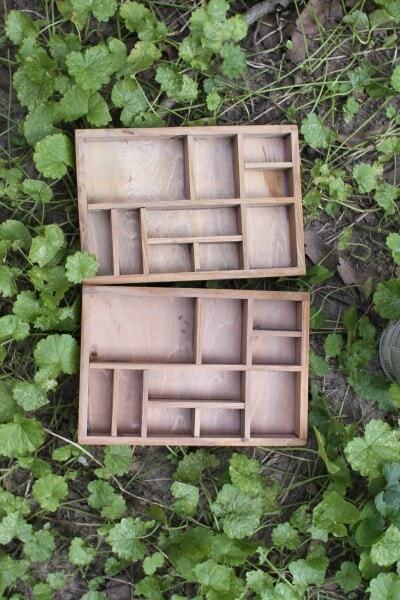 How lovely to have this done in time for school — they must be thrilled! It looks great! I really like the contract with the white furniture and accessories. I’m curious where they came up the the names Wilson and Sheldon. My best friend’s dog is Sheldon after the Big Bang Theory character. I think Sheldon is actually named after Plankton, from Sponge Bob! Wilson, I’m not sure about. He’s Sonia’s hamster, and she usually comes up with names all on her own. She doesn’t need any inspiration. Ha. 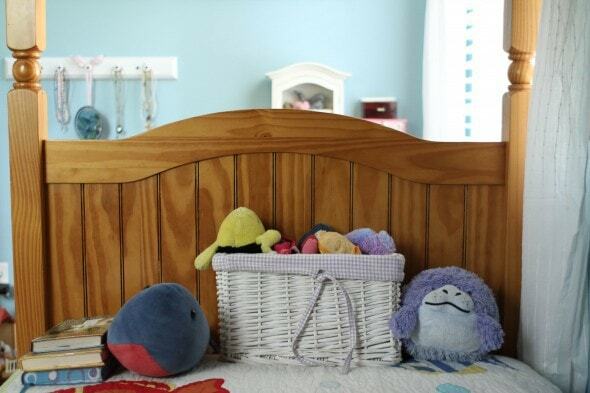 I love that you instill their bedroom with lots of style, some minimalism, re-purposing, and a personal touch too. Bravo Frugal Girl! 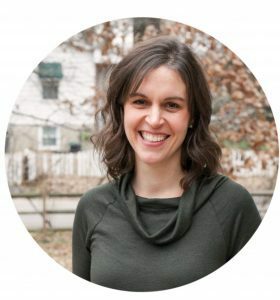 I know most people will be making a comment on your great redecorating skills (which are superb) but this post actually makes me think of what a great and thoughtful mother you are. Aww, that is so sweet of you. Thank you for your encouragement! That is a lot of work! It makes me tired just looking at it! If you need any more practice our house needs painting! I’ve never gotten so brave as to paint with chalkboard paint, but we do have a fun new chalkboard hanging in our kitchen. Works like…….well, magic, I’m relieved to report….after a few anxious minutes when wiping with a damp cloth didn’t work. I don’t know that I’d have been brave enough to paint a huge wall, but since this one is small, it felt ok to take the plunge! Wow, it all looks so clean and neat! 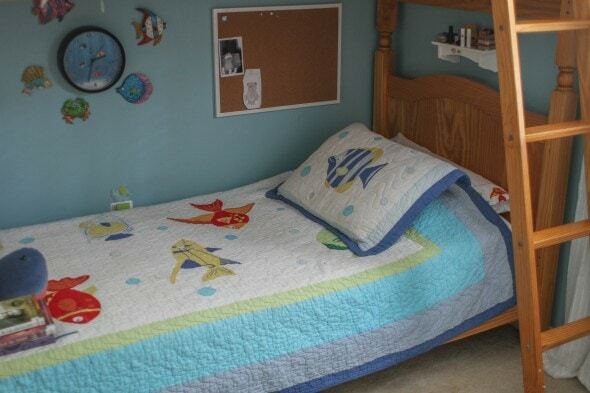 I wouldn’t fret about the oak bed at all – I think it’s nice not to have the room all white and blue. Breaks it up a bit. Plus, I’m lazy. So. Well, apparently I am too. I think the room is phenomenal. 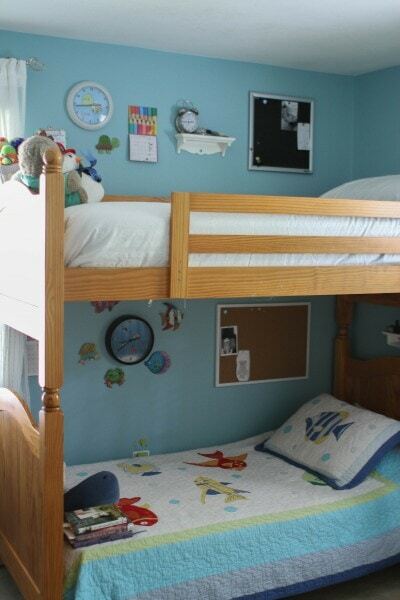 I hope they looove it (I particularly love that they each have their own clock in their portion of the bunk bed!). 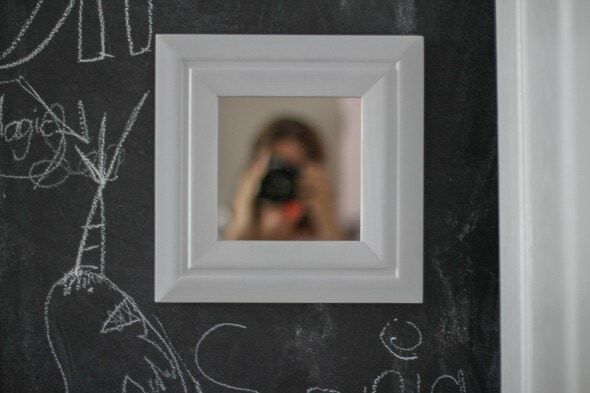 I have a horror story about chalkboard paint. I moved into a house I rented when I first got to Wyoming. And the owners were willing to paint, but I mentioned I’d prefer to do it (you can never tell people’s painting abilities….). Every room in the house was a neon color practically. Except for the room they had their child in. It was DARK green, with dark green chalk paint on the largest wall. The wall was actually sort of bowing when I touched it. Turns out they painted over wallpaper, and the chalkboard paint is heavier than traditional paint (and thicker). And it started to make the original-to-the-house wallpaper come off the walls. Took days to pull it all down and scrape the rest off. So. Many. Days. Ohhh, wow. It probably seemed like a smart way to cover over wallpaper at the time. Oops. They like having their own clocks because then they can see what time it is in the morning without having to look at the other person’s clock. Also, did you notice Sonia has two clocks? 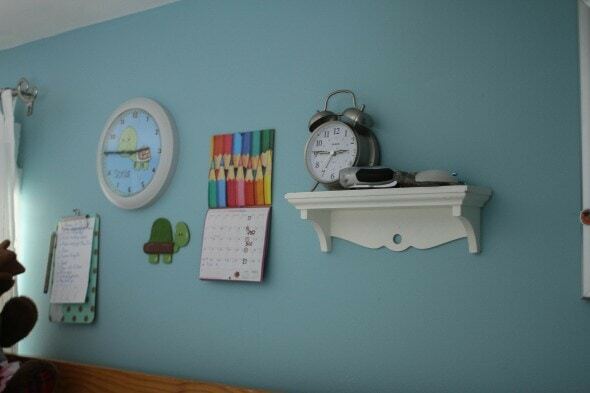 Her turtle wall clock and her double bell alarm clock! It looks fabulous! 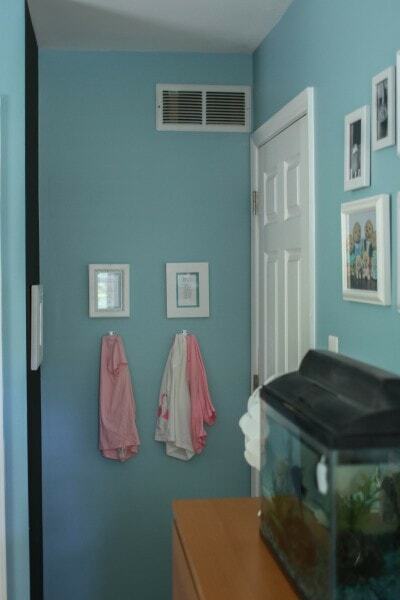 I really love the blue-green color on the wall. Thank you! I love it a lot more than I thought I would…and I think it fits their style very well too.